While an adherent generally of hopped, all-malt beer, I like some beers that are spiced, or that use rye and barley malt together. As in cooking, a nuanced touch with these additions often ensures success. One reason many dislike spiced beers is, I’m convinced, a heavy hand is used with spices and it produces the opposite effect. (One can fix these beers by blending them appropriately with similar beers, un-spiced). As Christmas approaches, one is reminded of the wassail bowl, a custom that is pagan in origins and lost in antiquity. The English way centered on ale (sometimes wine), spices, sugar, heated apples, toast. The burst apples looked fleecy, hence terms such as lambswool sometimes applied to this drink. 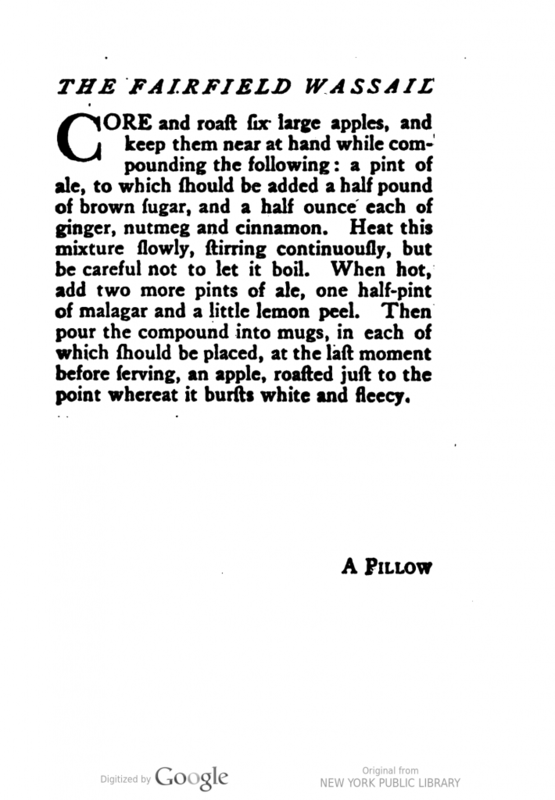 The recipe herein is typical of many more, and they vary only by the alcoholic supplements, generally brandy, malaga wine as here, brown sherry, etc. Eggs were sometimes used and an egged version shades into the nogs and cups of festivity. Those who disdain beers with spice, which pumpkin beer is and Christmas beers often are, are certainly “entitled”. However, the historical use of the types was extensive and is well-documented, that can’t be denied. Try the recipe included as the Season approaches, from The Squire’s Recipes by Kendall Banning (Chicago, 1912). The apple is optional, or if you like another, or a different spice than is specified, use that. A trait of these recipes is a do-it-yourself quality, while keeping to the general formula. Of the 100 and more similar examples I could offer from the books, I chose this one due to the oddity that the volume it is from was a hoax! The tome purported to be a musty inheritance found by a descendant of a U.S. Revolutionary War period “squire”. In fact it was written as a jape on a public credulous for antiquarian items. See the introduction for the full story. Still, the various drinks were obviously drawn from genuine sources – to do otherwise would have given away the book’s secret too early, for one thing. So I proffer the “Fairfield Wassail” nonetheless as a way to make a seasonal spiced ale. (Extract appears courtesy HathiTrust under my usual reserves in that regard).